6.) Can the Registrar act as a Directors? 11.) A consumer selects a package tour from a tour wholesaler and chooses a hotel some distance from town, which appeals to the consumer who wants a quiet location for her holiday. When she arrives at the hotel, she is upset by the non-stop noise outside her room as the hotel starts construction of a new swimming pool. Who is to blame for this consumer’s dissatisfaction? a. The hotel, which should have cancelled all bookings during construction. b. The travel wholesaler, which should have disclosed in its brochure information about construction or renovation of the property. c. The woman, who should have more thoroughly researched the hotel before booking. d. The hotel, which should have offered all its guests a set of ear plugs. 12.) ABC, a wholesaler, has been selling XYZ Resort since the resort opened in 1965. ABC still puts a photograph of the resort from 1965 in the brochure to show off the location’s beauty. In fact, the resort has not been upgraded or renovated since 1965 and has become run-down and outdated. Has ABC Travel done anything wrong in its brochure? a. No, as long as the company states in the brochure that the photograph was taken in 1965.
b. Yes, because the photograph does not accurately depict the current condition of the resort. c. No, because the Regulation requires that a photograph be used in advertising, but leaves content to the discretion of the registrant. d. Yes, because no photograph should be used in representations. 15.) A client buys a vacation package from ABC Tours on May 1. The departure date is June 15. ABC Tours pays the travel wholesaler on May 8. On which date must the travel wholesaler produce the tickets, vouchers, itinerary, and other related documents to the travel agent? 16.) Which one of the following circumstances would NOT result in the travel agent having to offer the client a full refund or comparable alternate travel services. b. Where a scheduled departure of any transportation is delayed or advanced by 12 hours or less. 18.) Which of the following is NOT part of the Travel Industry Compensation Fund? 19.) Which of the following could a client claim from the Travel Industry Compensation Fund? 20.) If a consumer makes a claim against the Travel Industry Compensation Fund and the TICO Board accepts the claim, what is the maximum amount payable? 21.) Joe and Sally are originally from Sudbury, but now live in Windsor. They depart from Toronto for a round-trip vacation package to Europe. When the supplier declares bankruptcy, Joe and Sally are stranded overseas. Under the trip completion provision in Ontario Regulation 26/05, where can Joe and Sally be returned, assuming that costs for each destination are approximately the same? 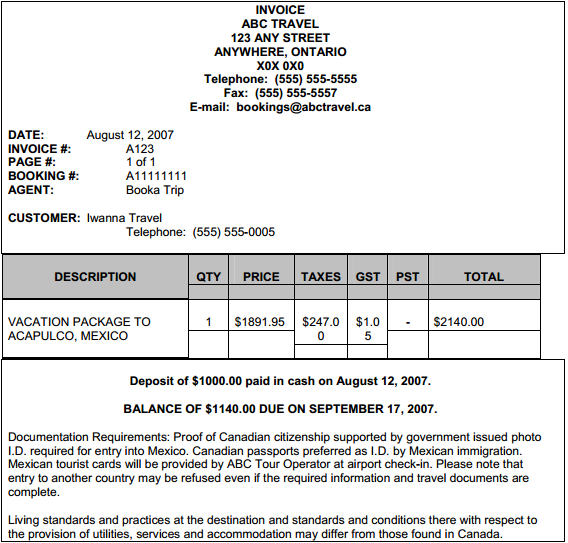 a. accept the claim because Joe dealt with the suppliers in good faith and the service fee was part of the travel service package. d. refuse the claim because it was illegal for Joe to charge a service fee in the first place. 23.) Sally Smith belongs to a travel program. She saves up her points for two years until she has enough for a vacation package at a sun destination. The travel wholesaler noted in the brochure that the trip was valued at $2500.00. After Sally transfers the points to the travel wholesaler, the wholesaler declares bankruptcy. Sally files a claim on the Travel Industry Compensation Fund for $2500.00. Would her claim be eligible for reimbursement? d. No, because travel wholesalers are not covered by the Compensation Fund. Hey… I’m writing tomorrow … Just wondered if they use trick questions and are questions the same as what was on the sample exam? why I only could see the first one? How do I go thru? Just curious on the scoring. How many wrong would not be a pass? Are you sure question 12 answer is correct? I would think b is the correct response as the photograph does not accurately depict the resort now.